I'm one of those people who clings to summer in all its glory. I don't care if school has started, I don't care if the fall equinox has come and gone. If it's warm enough to swim, if tomatoes and eggplant are still ripening on the vine...it's still summer. That's my story and I'm sticking to it. Today doesn't feel like summer in Shohola. The leaves are turning, the temperature hasn't hit 60 all day, and taking the docks out of the lake tomorrow morning is NOT going to be fun. As my official goodbye to the summer garden, I decided to make something special: mirza. I first tasted mirza at Persepolis, a fabulous Persian restaurant in our NYC neighborhood. 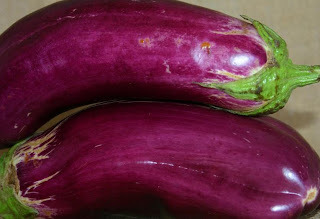 I assumed anything that delicious must be difficult to make, but when I looked in the refrigerator this afternoon and saw the last two eggplants of the season, I decided to take up the challenge. I'm happy to report that while the taste is complex, it's actually quite simple to put together. Here's my culinary farewell to summer. It's been swell, and I can't wait to do it again next year! In a 400 degree oven, roast the eggplants until they're soft. Let them cool, peel them and mash the flesh. Saute onions and garlic in olive oil until they're golden brown; stir in turmeric, salt, and pepper. Transfer eggplant mixture to food processor and add chopped tomato; puree. Return puree to pan and cook over low heat for 5 minutes; pour eggs on top of eggplant and as they start to solidify, stir them into the eggplant mixture. This can be served warm or at room temperature, scooped on pita bread or simply eaten with a spoon. The mirza sounds wonderful - and I've been looking for a novel way to incorporate eggs with veg. It's feeling very post-summer here, too - good luck getting those docks out of the lake tomorrow.